Villa Dolce: A romantic and welcoming villa which faces the sun and the sea. Villa Dolce is a romantic and welcoming villa which faces the sun and the sea. It sleeps four people. From Villa Dolce you will enjoy a wonderful view of Positano and of the sea. Villa Dolce is 60 square meters (645 square feet). It features a spacious private terrace with a view of the sea, air conditioning (please read description below to check in which rooms the units are installed) and winter heating. You will be at a short distance from the center of Positano, where you will find restaurants and shops. You will find the closest restaurant, a grocery store, the stop for the SITA bus Amalfi - Sorrento line at 100 meters (330 feet) and the closest beach (Spiaggia Grande di Positano) at 1.5 km (roughly 1 mile). You will reach Villa Dolce from the street level going up a 50-meters (165-feet) public walkway that includes approximately 80 stairway steps. You will not need a car to stay at Villa Dolce. If you do have one, you will be able to park it along the public roads (the actual distance might vary depending on the availability of parking spaces). 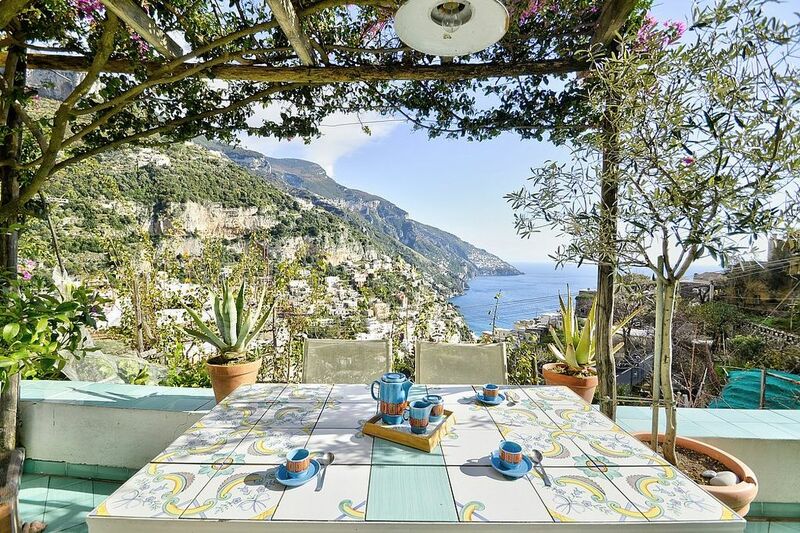 Villa Dolce is a house located in the upper area of Positano, not far from the state road. It is part of a group of houses built on the slopes of a steep hill which overlooks most part of Positano and the sea. Villa Dolce is surrounded by the characteristic little white houses of Positano, each with its own small garden or flowered terraces and inhabited by local families and not crowds of tourists. Even Villa Dolce has its own terrace, caressed by the sun all day long. While on the terrace, you will have a view which embraces an area going from the surrounding hills to the picturesque valley where Positano is nestled, not mentioning the view of the coast and the sea. The terrace is the entrance of the house and stretches before the whole living-room and bedroom area. A small gate and a wall separate the house from the little pedestrian road. Once on the terrace, you will notice that you have arrived in a special place: the panorama comprising the sea, the coast, and Positano will absolutely enchant you. The terrace is the perfect frame to such beauty, with its glossy sea green terracotta on the floor and on the top of the surrounding white wall, a red boungainvillea which stretches out its flowered branches towards the sun, the white garden furniture, the large canvas umbrella, and vases with flowers. Right below the terrace, you will see the green of a small and tidy family vegetable garden, typical of the Amalfi Coast. The terrace will be your favorite place in the house: while sitting outdoors, you will feast your eyes on a scenery of coast and sea; you will feel as if before a canvas with vivid colors which change hues according to the hours of the day and night. Spending time in the terrace will be definitely pleasant with a good book in hand or while having breakfast in the fresh air of the early morning hours, or even while dining under the stars! The terrace is 25 square meters (270 square feet) large. It is partly shaded by a perfumed bougainvillea pergola. It is equipped with a table, chairs, a sun umbrella and two deck chairs. From the terrace you will enjoy a splendid view of the sea, of Positano and of the Amalfi Coast. The living room is paved with tiles with handmade decoration, in the characteristic style of the Amalfi Coast. The furnishings are cozy and comfortable, and include some antique pieces. The furnishings include two armchairs and a divan that unfolds into a double bed. The dining table can accommodate six guests. In this room you will find a large television (local channels). From the living room you will be able to enter the terrace with a view of the sea and of Positano through a French door. The room is equipped with an air conditioning/heating unit. You will be able to enter the kitchen from the living room through an arched opening. It is equipped with a four-burner gas cooker, an electric oven, a refrigerator with freezer, an Italian-style coffee-maker, a toaster and a kettle. You will be able to enter the bedroom from the living room. The bedroom has a matrimonial bed (160 cm/62 inches, wider than a queen-size bed). From the bedroom you will be able to enter the terrace with a view of the sea and of the coastline through a French door. The bedroom is equipped with an air conditioning/heating unit. The bathroom is spacious and equipped with a washbasin, a toilet, a shower and a hairdryer. Here you will also find an iron and an ironing board. You will be able to enter the bathroom from the living room. My nephew and I spent Christmas week at this condo. The Villa is perfect for a couple or small family. The place was immaculate and had a nice sized living room; bathroom and kitchen. Though the bedroom was small, I wasn't in Positano to sleep all day! I would lay at the other end of the bed so I could see the fantastic night skyline. It was incredible and the part I miss the most of staying at this spot. Wake up and have coffee on the patio, come home and have a cocktail in the same spot. I felt we were 'where the locals lived' and not in the crazy tourist spot. There was a bus stop at the end of the steps to the condo. 84 steps to be exact, but discovered this was less steps than most condo's!! So from this place you can take a bus to beach area and shops; walk the winding roads; or figure out where the step passages were! I was a pro in a week. My biggest suggestion is to talk to David, the best host ever!, and listen to him to where to meet with the car, Positano is layed out like no other city have been to (and loved it), but save yourself an hour, and don't rely on Google maps to get you at the front door the first time around. Oh, there was also a convenient store close by and restaurants. We parked the car at Anna Parking.....GREAT people! I am ready to jump on a plane and return, and YES, I would stay at Villa Dolce again! Villa Dolce was a dream come true! The villa itself is absolutely stunning! The terrace is the best part, we ate breakfast every morning out there and enjoyed the incredible views. Thank you, we truly enjoyed our stay so very much! The caretaker, Davide, was so friendly and welcoming and helpful! He showed us around the villa and even took us to a few local shops in the area. Summer In Italy made booking this villa so incredibly easy. They were always so helpful, whether it be answering emails or questions or giving us recommendations they were always available and gave us quick responses. Thank you! Villa Dolce was a dream come true! The owner, Davide, was so friendly and welcoming and helpful! He showed us around the villa and even took us to a few local shops in the area. The villa itself is absolutely stunning! The terrace is the best part, we ate breakfast every morning out there and enjoyed the incredible views. Thank you, we truly enjoyed our stay so very much! Amazing apartment with gorgeous views! Easily accessible to local amenities including the bus! We had a great stay at villa dolce. It was a shame this was only for three nights - we could have done with longer. The view from the appartment is wonderful. One of the best I should imagine. The apartment is well cared for and extremely clean. The only criticism is the ac was not working in the bedroom however this did not bother us too much. There is a shop and bar really close by for supplies/ food. Although we found the shop a little expensive it did have everything we needed. It is only a sort walk down (several!). Steps into the town- however their is a bus service that is very regular and saved us the journey back up. Davide was an extremely welcoming and helpful host! We will definitely be coming back at some point in the future! We loved it. Highly recommend this lovely spot. Davide [the caretaker] was welcoming and very helpful throughout our stay. wonderful in every way...hope to return! The rental price includes: electricity; linens; towels; tourist tax. To be paid at the property:final cleaning EUR 40.00.